Marine coatings increasingly are center stage, not simply to maintain the integrity of vessels, but as a means to make ship ops more efficient and environmentally benign. Maritime Reporter had questons, and two executives – Andreas Glud of Hempel A/S and Michael Hindmarsh of AkzoNobel and – offered answers. What are the drivers for coatings development in the coming five years? Glud	The drive to optimize operational efficiency will continue to drive customer demand in the coming years. Ship owners and operators are becoming more and more cost and performance focused leading to suppliers needing to deliver innovative solutions that will impact the bottom line. Advanced hull coatings offer such a solution as they deliver a fast return on investment with the potential for a large reduction in fuel consumption. In fact, the best of today’s advanced hull coatings - such as Hempel’s Hempaguard - are able to deliver up to six percent on average fuel savings over the entire docking interval. This is irrespective of trading patterns, speed and idle periods giving the ship owner and operator significant trading flexibility. Hindmarsh	One of the biggest issues we see in the next five years is the continuing challenge to reduce shipping’s CO2 emissions. Recent discussions at the IMO are setting the stage for tackling de-carbonization and laying the foundations for a greenhouse gas (GHG) reduction strategy, aiming for adoption of an interim strategy at MEPC 72 in April next year. These discussions have been supported by many shipowner organizations, such as the European shipowners’ body ECSA - and it is clear that the wider industry is increasingly putting its weight behind a shift towards a lower carbon future. 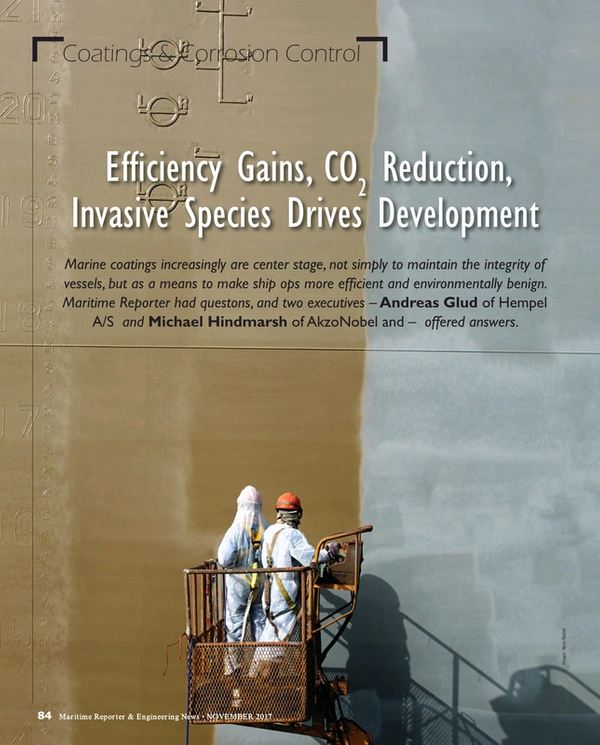 Marine fouling control coatings have an integral role to play in reducing GHG emissions. Ship owners and operators using AkzoNobel’s Intersleek range of biocide-free marine coatings, for example, have achieved fuel savings worth an estimated combined total of $3 billion since the technology was first introduced 21 years ago – saving 32 million tons of CO2. We know, however, that the push for de-carbonizsation must also compete with the economic realities of the shipping industry – and this means convincing a financially challenged market that de-carbonization not only makes environmental, but economic sense. This is why we have pioneered programs such as carbon credits - an industry-first scheme that rewards owners who choose to use a biocide-free foul release coating such as Intersleek 1100SR by awarding them carbon credits for each tonne of carbon saved, which can then be traded or used to offset emissions in other areas. This effectively rewards owners twice for selecting sustainable coatings – once when they save fuel by using these coatings, and then when they are awarded the credits. Much has been discussed for the past dozen years regarding the transport of invasive species in ballast water, but what is the situation in your corner of the market? Hindmarsh	Another major trend on our horizon is the focus on reducing the translocation of invasive aquatic species on the underwater sides of ships hulls. In August the IMO launched a new global project, the GloFouling Partnership, to encourage the uptake of the IMO Guidelines for the control and management of ships’ biofouling (resolution MEPC.207(62)). These guidelines as they stand are not mandatory – but they do outline what best practice looks like for owners and operators wishing to stay ahead of the curve. This looks like the smart choice, as many countries and regions are beginning to move ahead of the IMO and introduce their own biofouling regulations. For example, from May 2018, New Zealand will require all vessels that arrive in its waters to have ‘clean hulls’, with varying levels of fouling acceptable depending on the vessel’s itinerary. This region has also seen the world’s first biofouling “casualty” as the bulk carrier DL Marigold was turned away having been deemed an invasive species risk. The state of California also intends to tighten up its regulations on biofouling to include the mandatory biofouling management of the vessel’s wetted surfaces. What is your company’s most recent product/system launch? Please provide insights on its performance promise, and if possible, real-world case study reference of application. Glud	We recently launched two new premium antifouling coatings – Globic 9500M and Globic 9500S – offering customers a maximum speed loss of 2.5 percent over five years. (See full details on previous page.) This reduction equates to significant fuel savings and lower CO2 emissions; improving the operational efficiency of a vessel and minimising the operator’s environmental footprint. Globic 9500M (M for maintenance) is designed to protect against slime as well as soft and hard fouling in all conditions. Globic 9500S (S for static) is designed to protect against hard-fouling even during extended outfitting periods. Together these two coatings deliver unparalleled anti-fouling protection. These two Globic coatings are built on our patented Nano acrylate technology, which delivers superior antifouling performance for new buildings and dry-dockings. This Nano acrylate technology provides a fine polishing control mechanism to bring the integral biocides to the surface at a stable rate ensuring a clean hull. The unique technology activates as soon as the hull meets the water for full and immediate antifouling protection. For this reason, this technology also provides a highly efficient solution for slow steaming and long idle periods. Hindmarsh	We recently launched Intertrac OBM (On Board Maintenance), the latest advancement to the Intertrac range, which will help customers reduce sea stores costs by up to 20%. This online tool records, visualizes and analyzes Seastores purchasing patterns by vessel and fleet. Intertrac OBM provides greater transparency and control over OBM paint consumption as well as purchasing and has a number of features. These include streamlining purchasing to avoid small quantity orders and additional administration costs. It also identifies alternative ports with greater savings potential, and optimizes product choice to provide cost savings. We also launched Intertrac Perform as a pilot initiative. This tool measures and monitors hull performance data and validates it against predictions made by Intertrac Vision, AkzoNobel’s landmark big data tool for coating performance prediction. Developed in partnership with University College London, this software builds on the capabilities of Intertrac, a tool which analyses the fouling challenges of different trading routes, and Intertrac Vision, launched in 2015, a big data tool which combines this data with hydrodynamic analysis to predict hull performance. With Intertrac Perform, the Intertrac range forms a complete digital solution for predicting, measuring and analyzing coating performance, without the need for any expensive equipment to be installed.